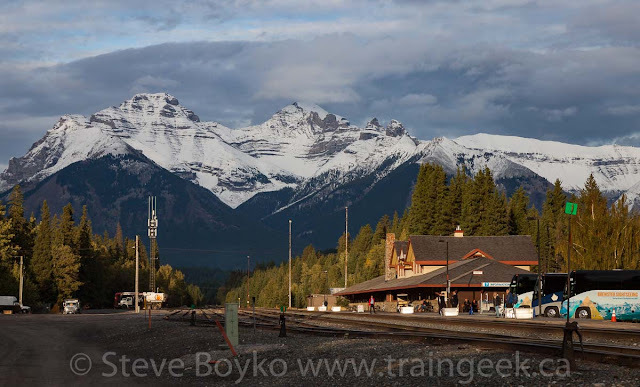 - Doobie Brothers, "Keep This Train A-Rollin'"
When we left off, my wife and I were on day 5 of my 50th birthday railfan trip, heading to Banff, Alberta on highway 1A (also known as the Bow Valley Parkway), after chasing a train through the Spiral Tunnels to Lake Louise. We drove into town and I stopped at the train station at about 4:30 PM to ask when the Rocky Mountaineer was coming in. The person behind the RM counter said they would be arriving around 7 PM. Great! We checked into our hotel (the Elk + Avenue, a nice but rather expensive hotel). After a bit, we headed over to the station to see the Rocky. At first I went to Banff East (at Compound Road) but nothing was around. I was listening to my scanner and heard chatter about a meet at the station, so we drove over to the station and parked there. My wife sat in the car while I went over to the crossing at Mt. Norquay Road to wait. A guy driving a blue Alberta pickup showed up and started wandering all over the tracks, taking photos and being rather unsafe. I don't know if he was a railfan and I didn't speak with him. A few minutes later, CP 8948 East showed up. It was pulling a big ol' grain train. 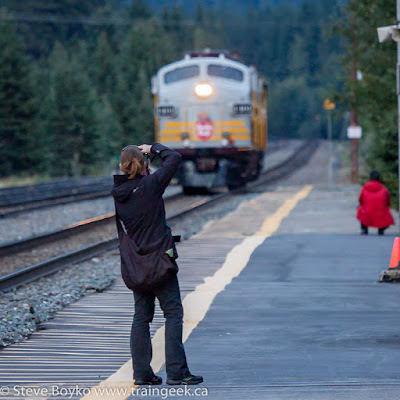 You can see some of the Rocky Mountaineer staff on the platform by the station. 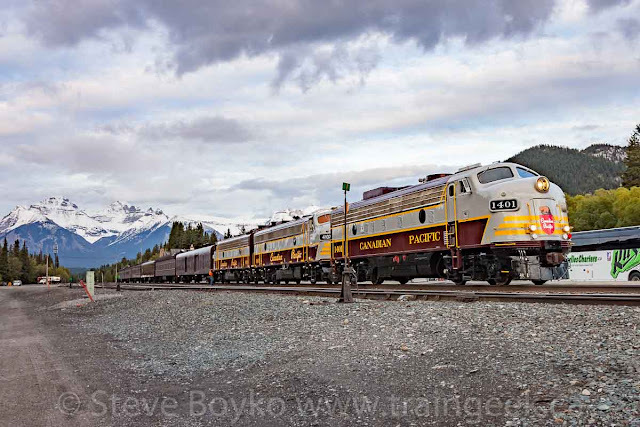 This train had a shiny locomotive on it, freshly repainted CP 9835 with the new "golden beaver" logo. CP 9835 and 8639 were the first two locomotives to receive the new, simplified beaver and came out of Relco's Albia, Iowa shops in July 2017. 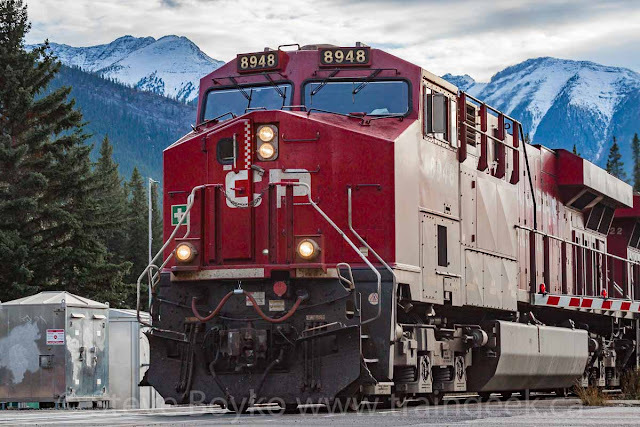 It's so rare to see a clean locomotive on CP these days! 9835 really stood out. After standing on the ballast, too close to the train, Mr. Unsafe took off. 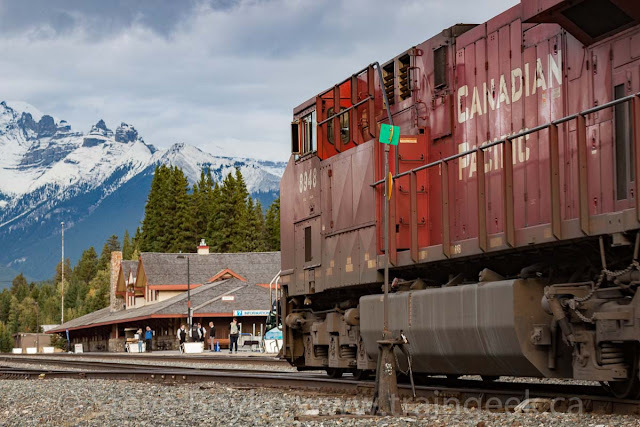 The train wasn't going very fast, and the reason why became evident when the tail end passed me. Here's the other train! 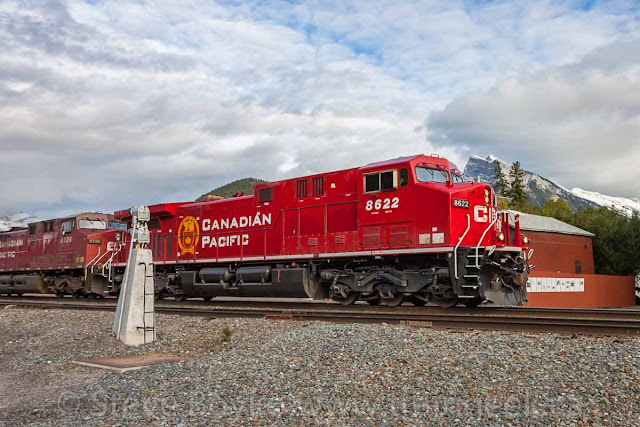 CP 8622 was waiting on the main for the other train to clear. They took off to the west without delay. I saw an interesting car in the train. It is lettered COER 354978 but I could see the KCS underneath the patch. Apparently there are a few of these kicking around. Here's a photo of the same car in August with the same graffiti. I found that photo on this thread featuring my friend Bill Brillinger! Here's the video I took of CP 8622 West. After the DPU - CP 8819 - passed by, all was quiet for about half an hour. 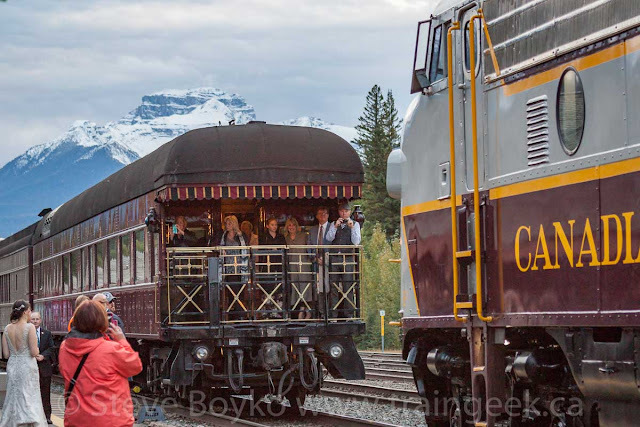 Everyone was waiting for the Rocky Mountaineer to show up. 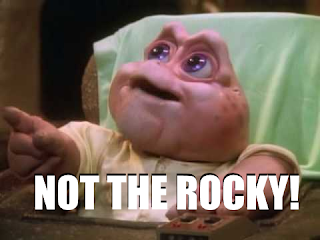 I talked with a couple - from Tennessee, I think - who were going to ride the Rocky the next morning. They were really looking forward to the trip and were out to see their train come in. It was the Royal Canadian Pacific! I was delighted to see the RCP - and maybe a bit puzzled. Why was it here? Oh well... don't ask questions, just take pictures! They pulled up until the whole train was at the station, and stopped briefly. Given the poor lighting (it was 7 PM and not very bright out) I took some 3 frame HDR photos and combined them. The conductor got out and uncoupled the power from the train. If you expand the photo above, you'll see him down at the junction of CP 4106 and CP 95. Once the power was uncoupled, they pulled ahead through the crossing, then reversed along the siding waaaayy down to the east to the other siding switch. 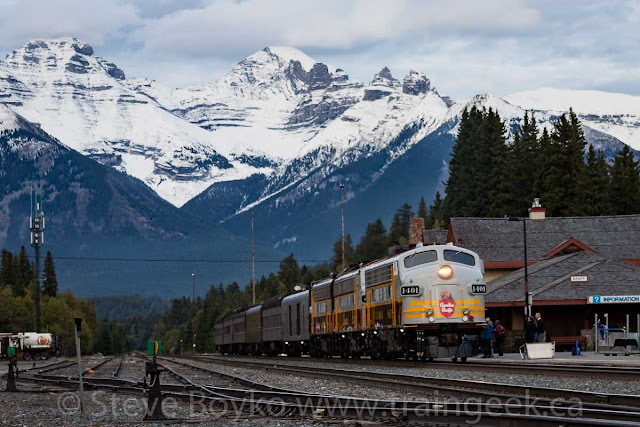 While they were doing that, I walked along the station platform and recorded the consist: CP 1401 / CP 4107 / CP 4106 / CP 95 / CP 77 "VAN HORNE" / CP 103 "MAJOR ROGERS" / "ROYAL WENTWORTH" / "CRAIGELLACHIE" / CP 74 "MOUNT STEPHEN". I thought the view of CP 1401 coming up with the mountains in the background would look great. Wouldn't this have been nice without the chimping photographer? There was quite a crowd on the end of MOUNT STEPHEN watching the proceedings. That's the bride on the left. I took video at a few points and combined them into this video. 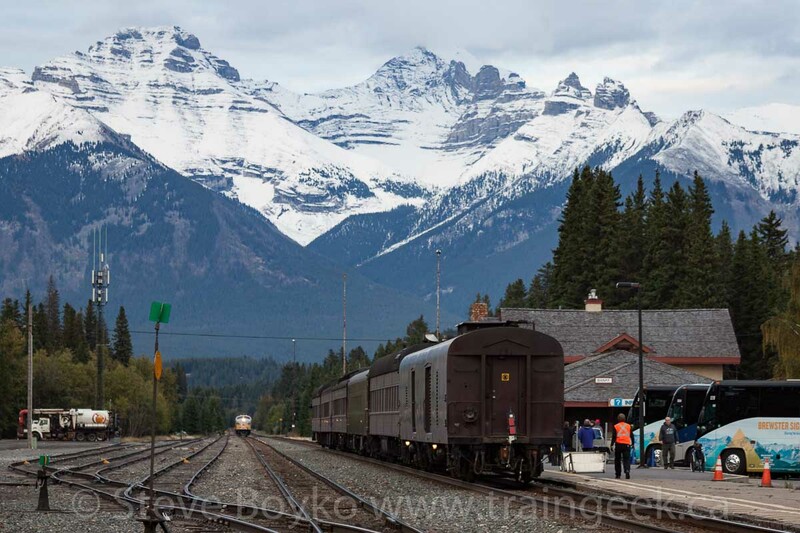 So I didn't wait for the Rocky Mountaineer to eventually arrive. I figured we could catch it departing in the morning. 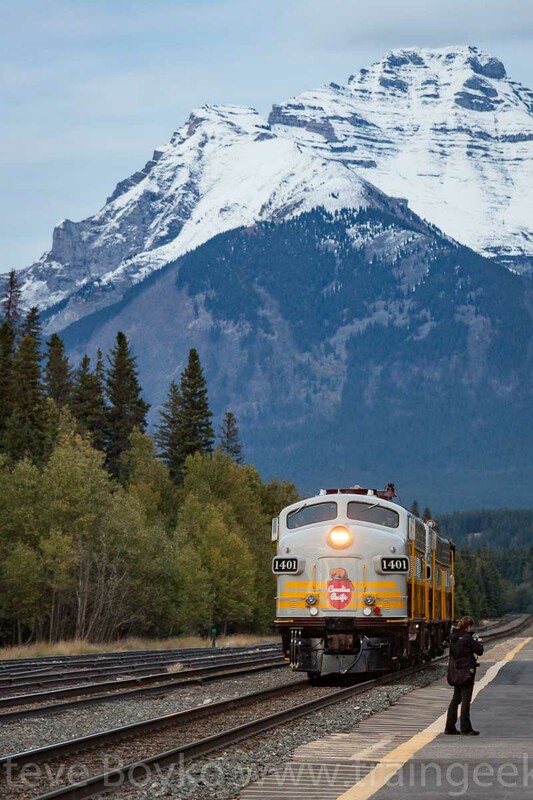 We wandered around Banff looking for a restaurant that didn't have a huge waiting list. It was tough! We finally found the Bear Street Tavern, a place that advertises "ridiculously good pizza". We had eaten there on a previous visit and it was just as good this time. Highly recommended. We spent day 6 in the Banff area, starting with a little chase of the Rocky Mountaineer before we finally got to Lake Louise. One more post in this series... READ ON! Great photos Steve!! 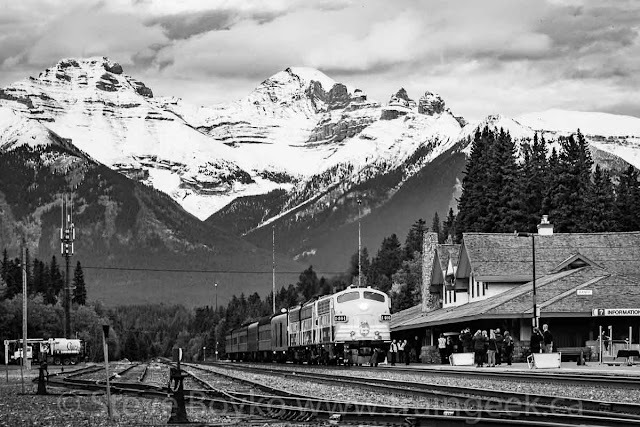 Too bad about that other photographer in that shot, its still a great photo! I feel the same way about certain things in my shots, but I am never in a time crunch since my subjects don't move lol.